Cara Delevingne's go-to make-up artist, Wendy Rowe, tells all. If there's one person we can point to as determining the trajectory of not only tweezer sales and Tumblr feeds, but the preferred size and shape of eyebrows, well, everywhere, it's (if it wasn't entirely obvious enough already), Cara Delevingne. We mean, duh, right?! One look at Delevingne will have you hypnotically at least shelving your tweezers permanently with one hand, and phoning up your aesthetician to cancel your long-standing waxing and threading appointments with the other. 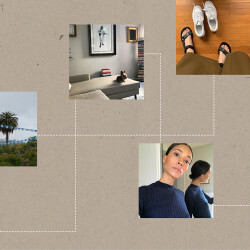 And so while we've been working on growing out our eyebrows for a while now, there have admittedly been moments where, while weak on resolve, we've been more than tempted to take back out the tweezers and start carving out itty-bitty arches. In an effort to circumvent our inevitable 'help-I-have-sperm-eyebrows!' downfall, we reached out to make-up artist Wendy Rowe (who's only powdered the faces and lined the lids of everyone from Gisele to Naomi—NBD, you guys). Rowe was not only kind enough to talk us off of the proverbial ledge, but share a few exclusive on-set snaps (including ones of a virtually unrecognizable Delevingne with bleached-out brows) with us, too. First things first—Rowe explained that for Delevingne, it's really all about contrast: "Cara's brows are the strongest feature on her face, which is why they receive so much attention. They are dark and shapely, and it's the fact that hers are so dark for a blonde-haired girl that they make such an impression." Oh, and just FYI? Similar to just about everything else that pertains to the profession of modelling, it also helps to be born with it. "Cara has really dark, dense brows naturally, so there's not a lot that I have to do to them to get them looking great. I mainly focus on grooming them and keeping them in position." 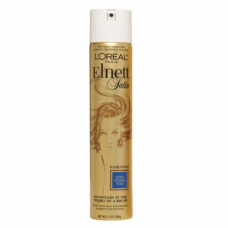 Elnett hairspray, sprayed onto a M.A.C. 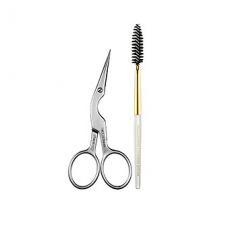 Brow Gel to keep them in place—it’s easy to just comb through quickly, and when you have a lots of hair it’s important to fix it in shape as it can become unruly." You guys are taking notes, right? Oh, and on the whole embracing it front? "Everyone has different brows and I think people now understand that you need to work with your own brow shape to create the best look for you. It's not about trying to copy Cara's brows, as you won't achieve brows like that if you don't have dense, dark brow hairs naturally." We know, we know. But take heed from Rowe's own words of wisdom and work with what you've got—or, um, suffer the consequences. 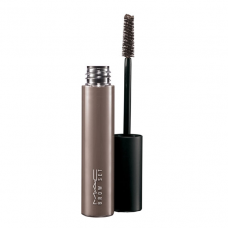 "If you have dense brow hairs but they are not dark, you can brush through a dark brown mascara to give a darker feel. If you do not have many brow hairs though, I don't recommend trying to pencil in brows to look hard and heavy if you don't naturally have hair—it will not look like Cara and will just look unnatural." If you're still feeling slightly uneasy about ditching your aesthetician (we know first-hand how they often double as therapists, only cheaper), did we mention how a fuller, more natural-looking brow can make your eyes look bigger? Bet that got your attention. "Cara naturally has big eyes, but you can enhance this and make them look bigger and more wide-eyed with makeup. I keep the darker shade towards the outer corner of the eyes, and I bring it quite low underneath—lower than you would expect, as this gives a natural shadow under the eye that creates a mask-like shape around the eyes to give the illusion of a bigger eye. It’s important that it’s soft in application and colour, with no hard lines—when the application is hard and precise, you can see the exact shape of the eyes so you close down your area. 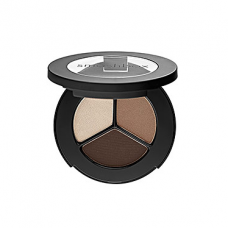 I also finish by applying a slightly lighter shade to the inner corners of her eye to open the eyes a little." Rowe's other go-to tricks for faking out bigger, bolder and—dare we say—better brows? Seriously, you'll want to at least break out your Notes app for this: "You can fill in your brows and create a slightly bigger shape though to give a feeling of a fuller brow that still feels real—when creating a strong (or bigger) brow shape, steer clear of powder products that tend to attach to the skin, creating a block colour that looks painted in. Instead, fill it in with a cream-textured product to create a bigger groomed shape that doesn't look overdone—my favorites are Suqqu Brow Liner, Anastasia Liquid Brow Liner and Tom Ford Brow Sculptor. 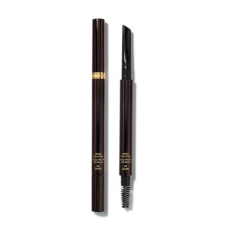 I love using more cream textured products for brows and applying with a fine angle brush, like Laura Mercier Brow Pots. Make sure the colour you use does not have red in it and don't use a colour too dark as it will just look drawn on. 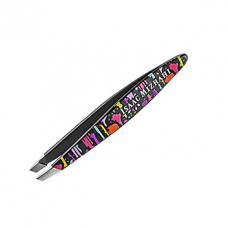 Always apply in brush strokes in the same direction the hairs naturally grow. This will have a see-through quality and look more natural as it won’t be heavy or solid." Now? Go forth and fill in those brows, but just remember—greatness isn't exactly achieved overnight. Yes, even when you're born with a set like Delevingne. Brow down, b*tches.